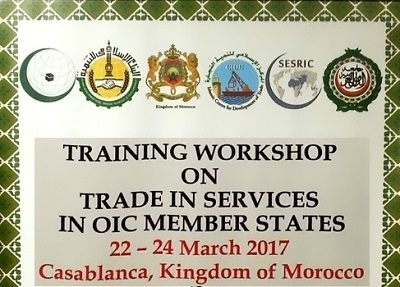 As part of its efforts in capacity building of member states in trade, SESRIC organized in collaboration with the Ministry in charge of Foreign Trade of the Kingdom of Morocco, Islamic Centre for Development of Trade (ICDT) and the International Trade Centre (ITC) the Training Workshop on “Trade in Services” for OIC Member States in Casablanca, Kingdom of Morocco on 22-24 March 2017. In addition, World Trade Organization (WTO) and United Nations Conference on Trade and Development (UNCTAD) were also partners of the event. 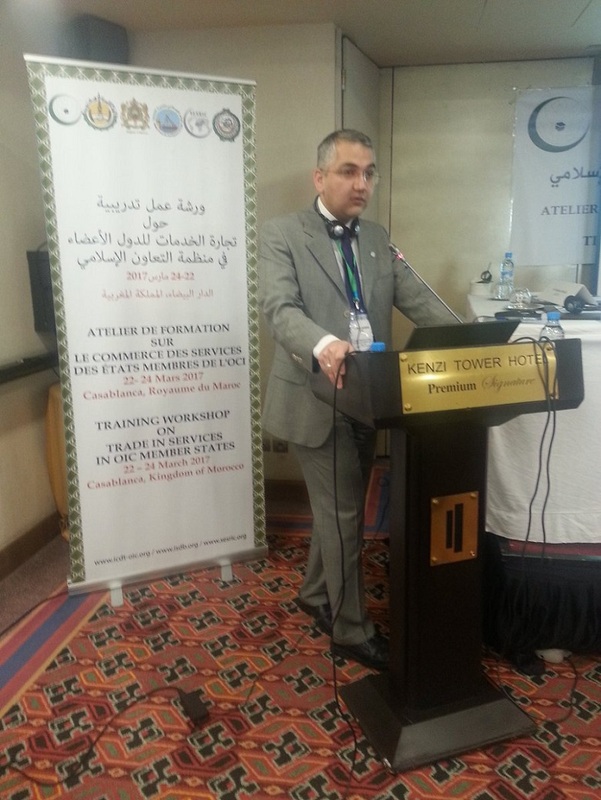 The Workshop was participated by experts from OIC member countries including Algeria, Saudi Arabia, Azerbaijan, Benin, Cameroon, Côte d'Ivoire, Egypt, Gabon, Indonesia, Jordan, Kazakhstan, Kuwait, Lebanon, Mauritania, Morocco, Niger, Oman, Palestine, Senegal, Sudan, Togo, Tunisia and Turkey, and from regional and international organizations including COMCEC Coordination Office, ICDT, Islamic Development Bank (IDB), ITC, League of Arab States (LAS), SESRIC and United Nations Conference on Trade and Development (UNCTAD). Dr. Kenan Bağcı, Researcher, and Dr. Atilla Karaman, Researcher, represented the Centre thereat. The workshop aimed at raising awareness of the OIC Member States’ officials and representatives on latest issues related to trade in services and increasing their capacities to promote trade in services at the OIC level, thus contributing to the economic development at the OIC level, boosting intra-OIC trade and assisting OIC Member States to achieve relevant sustainable development goals. 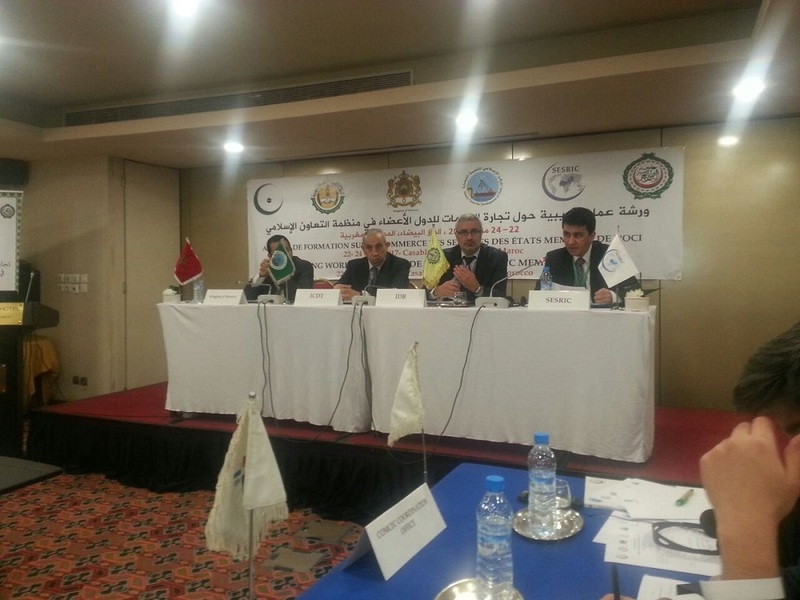 In their speeches, representatives of the Minister in charge of Foreign Trade of the Kingdom of Morocco, IDB, SESRIC and ICDT highlighted the importance of trade in services in global and intra-OIC trade as well as at the level of bilateral, regional and multilateral agreements. They also indicated the importance of the sector of services in regional economic integration through the implementation of the new generation of free trade agreements. The workshop recommended to Member States to integrate the services component into their bilateral, regional and multilateral trade negotiations.